A few days ago I saw that Jackie is hosting a challenge in her blog. The challenge is to make a card using one of the Spring 2013 Pantone colors. So far, Grayed Jade and Tender Shoots are up and running. The challenge will be open until September 22nd. You can read all the details here. Jackie and her challenges are awesome! I would love to win a free custom blog header designed by Jackie, which will go to one randomly selected winner! First I chose a suitable stamp that wouldn’t be too difficult to trace with liquid applique. I settled on this Rose Ornament stamp from Rubbernecker. The next step (the design) took me a while. I played around positioning the large ornament at the center, left corner, upper cornet…etc. while at the same time thinking of the greeting position. I kept telling myself that I needed to think outside the box! Then the idea of masking came, and after a bit of fine-tuning, this design was finalized. I masked an inch wide strip along the center and stamped the ornament. While keeping the masking tape on, I traced the stamped image with white liquid applique. Once done, I removed the tape and gently applied heat to puff up the traced lines. The Greeting was white embossed on a strip of light green vellum. The thin strips bordering the vellum are from the same card stock as the card base, only they were smeared with a Versamark ink pad to give them a darker shade of green. I applied thin strips of foam tape behind the green borders and adhered the panel to the card base. Once this card was done, I realized that I must have unconsciously CASE-d Jackie’s site banner! I hope you will get a chance to play along. If you do, make sure to link up your card at Jackie’s blog. You always come up with the most interesting techniques. This is really beautiful Tasnim!!! Thanks so much for sharing with your readers about my mini challenge on my blog. Hope you have a super fun weekend! 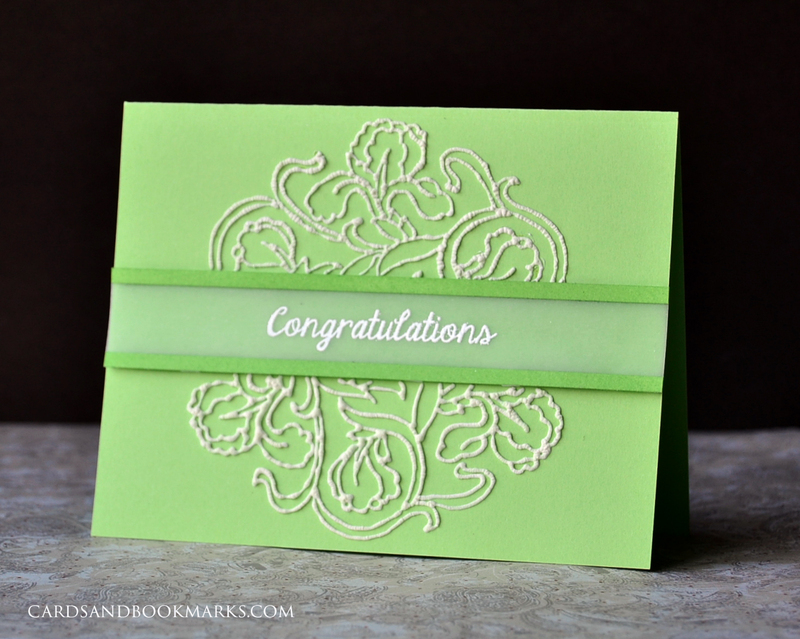 Tasnim, I love how you used the pretty color on this FABULOUS card! Well done! Thanks for the link to Jackie’s FUN challenge. I’m hoping to play along. This is beautiful, but it looks like so much work! Goodness, what a beautiful look!!! Love this! wow, fabulous – well done! It’s gorgeous!! Not sure I could get the appliqué that thin…..fabulous!! Oh WOW! I love this! Fantastic technique, gorgeous and so delicate!